The 2012 Vitess Challenge at the Forest City Velodrome had Juniors against Senior 1-2 men, U.S. vs Canada, sprinters elbowing the endurance guys. All night long the FCV had all the elements of a knock down, drag out ..... scrap. The only thing missing were the boxing gloves. 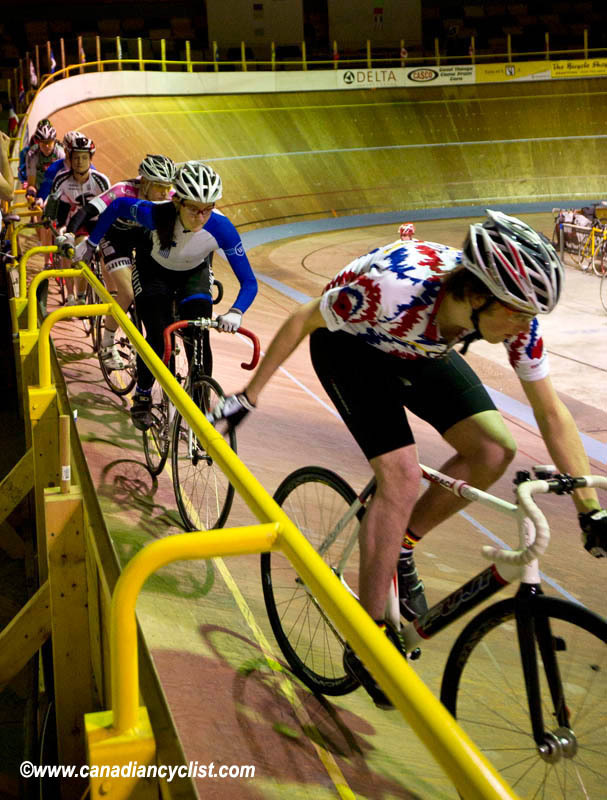 With over 67 racers packed into the infield of the 138m indoor Velodrome in London, Ontario, the racing was pinned all night. The Vitess Challenge was a series of elimination endurance races to choose the top 14 riders who would contest the winner-take-all Carbon bike frame from The Vitess Corporation. The sizable crowd of spectators arrived early. The warm-up had begun and the music was elevated in order to raise the excitement level. Warm-up on the track was quite interesting with 50+ riders trying to get their legs revved up for the the next three hours of painful fun. The Challenge was set up in a way that all four of the qualifying heats were done as random draws to determine which one each racer would start in. With the qualifiers set, the racing began. In the early heats the top riders made it through to the semi-final with very little trouble. There were several riders advancing to the semi's that should be highlighted, as they are very young riders doing battle and successfully making it through to the next round. Daniel M-P was on the ropes during the heats, battled back and used his sprinting ability to advance. Connor Byway (OBC) is 14 years old, and Connor showed race smarts in making it to the next round. The other rider that showed her fitness was Sara Rasmussen who finished second in the second heat to advance - well done. In the Semi-Finals, the competition started to heat up and, in fact, boiled over. All the line-ups were done randomly with riders picking their starting positions. There was a mix of heats just to make sure all events were split randomly. The first semi-final had a very nice mix of Elite 1-2 racers, Juniors, and Masters. The 60 lap event was pretty much on the rivet from the opening whistle. A flurry of attacks very quickly shredded the field and the top six riders - Marco Li (Garneau), Will Simmonds (Invita-FCV), Martin Veccio and Blaine Benson (both Black Line), Jeff Schiller (Garneau) and Adam Poll (Waterloo) easily dropped and lapped the rest of the riders to advance to the Vitess Challenge final. The second semi-final had two Elite women entered, plus a number of Cadets, Elite men and Masters. This race stayed together for the entire 60 lap distance. The pace of this semi-final was slightly slower than the first, and came down to a sprint finish for the final four spots as Chris Balestrini (Garneau) and Chris Singleton (Invita-FCV) had lapped the field in the closing few circuits. In the end, the speedsters 0f Adrian George (Invita-FCV), Dave Bogue (Team London), Candice Vermeulin (Invita-FCV) and Quinn Hanam (Waterloo) were able to advance. A very tough sprint for the other riders in this semi, as 9 of the 12 starters were in contention going into the final lap. Two riders advanced to the 99 lap feature from the last chance race; team mates Chris Vlemmix and Mike Renneboog (Team TC1) were the quickest. Early in the Final, the riders were changing the lead in order to feel each other out; to see who had the best legs. Thirty laps into the race everyoine was still together and the cash started to come in. The first Prime was a $30 payout to the first three riders. Sensing that the race was about to heat up, the Masters went to the front and took control of the early money, with Vlemmix, Renneboog and Hanam pocketing the cash. Less than two laps later, a very generous spectator came up with $75 for the first rider to lap the field. Money always brings out the best in racing. Blaine Benson was first to catch the field sleeping and, with no reaction from the pedestrian pace line, immediately gained three-quarters of a lap. Still no reaction, as he headed for the $75 payday and that's when, the hammer fell. Garneau went to the front, helped by Invita-FCV and Benson,who was within ten metres of the back of the bunch, saw his lead vaporize. As the group caught Benson with 50 to go, an attack from three riders on different teams - Simonds (Invita-FCV), Jeff Schiller (Garneau) and Martin Veccio (Black line) - worked together and, with 25 to go, had lapped the field. As the three leaders took their lap, Marco Li (Garneau) rolled off the front of the bunch. With no reaction from the bunch Li was even terms within 5 laps, and then there were four riders up a lap. With 20 to go, the decisive move of the race had Li (Garneau) again roll off the front with no reaction from the field. Li took another lap and was guaranteed the victory and the Vitess Challenge for 2012. The battle for second was very hotly contested, with first year Junior Will Simonds (Invita-FCV) just throwing his bike a little earlier than Jeff Schiller (Garneau). The FCV would like to thank Vitess Bicycles for their sponsorship of the evening. To all the volunteers a huge thank you for making the evening run very smoothly. 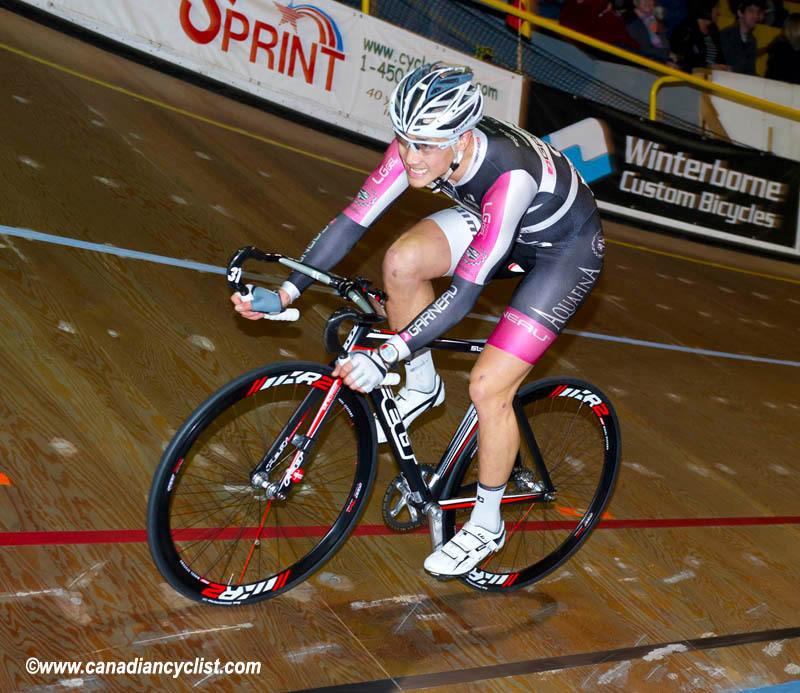 The next race at the Forest City Velodrome is Saturday, February 18th. 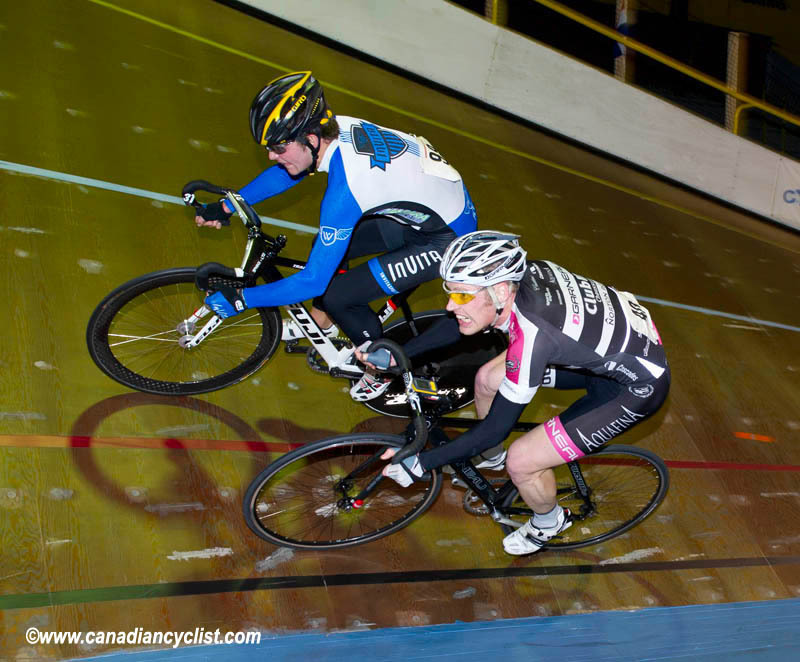 Got to www.ForestCityVelodrome.ca for all current up-to-date recreational programs at the FCV. Video Interviews with the top three finishers in the Vitess Challenge at the Forest City Velodrome - Marco Li, Will Simonds and Jeff Schiller.